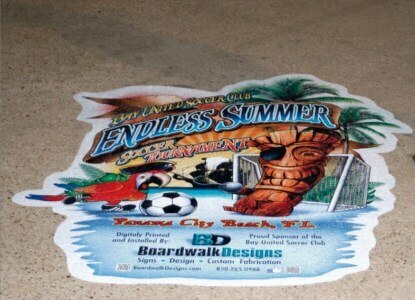 AlumiGraphics: Advertising on Floors in Orlando! The many uses of vinyl films come up a lot in this blog. This is due to the simple fact that vinyl is one of the most cost effective and versatile materials available. Yet, there are some situations where vinyl simply does not work. What are these circumstances? And, what options are better? 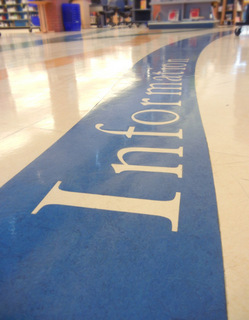 Today’s post is going to look at how AlumiGraphics are perfect for advertising on floors in Orlando. AlumiGraphics is a fairly new foil-based medium (FBM) that is already winning awards and taking the wide format digital printing world by storm. A heavy duty, pliable aluminum foil is used to make AlumiGraphics. This features unique characteristics that make it better than vinyl in many ways. You can easily transform underutilized spaces into affordable, mass marketing platforms with the addition of AlumiGraphics. Smooth and grip are the two main kinds of AlumiGraphics finishes. Grip is ideal for concrete, tile, asphalt, and other rigid walkway surfaces since it is slip-resistant and reflective. While, concrete blocks, brick, and stucco would benefit from the satin, non-glare finish of smooth AlumiGraphics. Holds up in a Wide Range of Temperatures – Since it is not as affected by temperatures as vinyl films are, FBM has a wide service range. As a matter of fact, it can be installed in temperatures close to freezing. This makes AlumiGraphics the perfect choice for outdoor installations. Holds the Shape of Any Surface – When FBM is applied to a surface, it conforms and holds to the shape of that surface. In situations where other wide format media fail, it works with the adhesive to provide a successful application. Heavy Duty Construction – The lifespan of AlumiGraphics is up to twelve months. In addition, compared to vinyl, it will not deteriorate or break down. This makes it ideal for short-term and long-term use in hot, cold, and wet weather. No Shrinkage – When you tile your graphics, you can forget about experiencing gaps or seams. For instance, when there are changes in temperature or moisture, vinyl films will sometimes retract exposing their adhesive and eventually peel off. This is not an issue with AlumiGraphics. Good for the Environment – This is the perfect material for businesses looking for sustainable, green signage. When the day comes to remove your AlumiGraphics, they can be disposed of with your other aluminum recycling since they do not contain any PVC or other hazardous elements. Easy to Install and Remove – Speaking of removing your graphics, it is quite easy, and the removal process leaves nothing behind. And, thanks to pressure sensitive adhesives, installation can be done quickly and will conform to rough or smooth textured surfaces. Citrus Sign Studio is still going to offer vinyl. It’s just now we have another solution for our customers. Depending on your project’s requirements, we will likely recommend FMB for rigid floors outdoors or in. Contact us today to learn more about putting AlumiGraphics to work for your enterprise.